LikeButton refers to the concept introduced by Facebook to express one’s affirmation in pressing digital Like buttons. The possibility to hit “Like” is available within the social network platform referring to actions taken, statements said and media uploaded, as well as integrated into external websites and services that have a page on Facebook. Facebook itself calls the Like button their most important “Social Plugin” , enabling users to share a page (or almost any other content) with their friends, expressing that they “liked” it. For widespread general use, Facebook provides a plugin for your side, generating your personal Like button code. Besides the importance within the peer group to see who actually liked what, the amount of “Likes” a page gets (be it a person or service or anything else) is a strong indication of general interest, acceptance and affirmation. The public display of the total number is therefore an essential part of the service. Facebook addresses this in including the number of people who liked a site within the automatically generated digital badge – thus becoming visible for anybody else who happens to visit the site. Our main interest lies in actually giving the Like statement a physical presence. This includes displaying the important information of how many people liked something to the user, as well as providing an adequate interface. 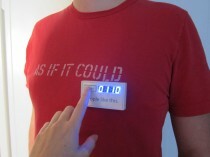 The result is a wearable badge freely attachable to any objects or clothes. The visual appearance is based on the design suggested by Facebook; expressing Like includes pressing a button, resulting in an immediate update of the total number of “people who like this”, visible on place and online on their Facebook wall.